It’s been a good couple of weeks since our return from China and as the cravings for Asian food began to creep back into our lives, it was high time to revisit them and cook something inspired by our trip. Having tasted some great tea-smoked duck on the ground as well as Neil Perry’s version on our Qantas flight home, I decided to give the process a go at home. Smoking duck breast at home is quite an easy thing to do and it basically takes care of itself. Just make sure to have your windows open, smoke alarm disabled and the stove rangehoodt on full speed… Otherwise you may have the whole fire brigade popping over for supper. Tea-smoking duck breasts or fish such as salmon lends it a lovely intense flavour of a traditional barbecue. It’s relatively easy to set up too. To make the pickled vegetables: julienne carrot and onion. Mix with sugar and salt and place in the fridge for 15 minutes to pickle. To make the stir fried vegetables: Finely slice both capsicums, snow peas, mushrooms and chilli. Heat sesame oil in a small pan and add capsicum, stir fry for a minute then add snow peas, mushrooms and chilli. Cook for another minute then remove from heat. To smoke the duck: combine rice, sugar and tea leaves in a bowl and mix. Place a double layer of aluminum foil on the bottom of a wok. Pour in the mixed ingredients then place wok over high heat. Cover with a lid allow to get smoking hot. Make sure to turn on your rangehood and open a window or two for good ventilation. In the meantime, heat a small pan over high heat. Sear the duck breasts, skin side down first for about 2 minutes to allow some of the fat to render, then flip and seal the other side for the same time. Transfer sealed breasts into the smoke-filled wok, turn the heat to medium and smoke for about 15 minutes. Turn off the heat and allow to rest under cover for another 5 minutes or so. 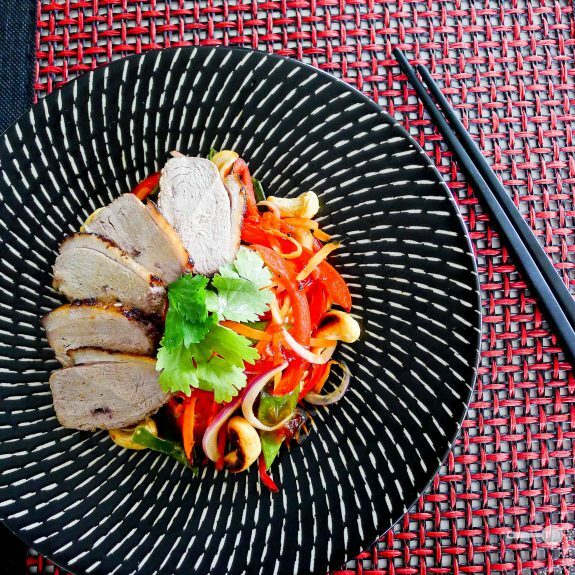 To serve: arrange half the salad on each plate and top with thinly sliced duck pieces and some coriander leaves. Drizzle with a little sweet chilli sauce. Enjoy warm or chilled. I love this recipe and the title! Oh wow, that’s pretty easy then! Love the flavours in the salad. Im surprised how simple that is. Did you get the plate in China? I love it! Thanks! Picked the plate up from Freedom here in Sydney. Quite a recent addition to my collection which may still be available in stores. What a neat idea. I wonder if it would work in an outdoor smoker? Hubs is always looking for new things to smoke in new ways. I’m pretty sure it would work in an outdoor smoker – yum! Might just need to adjust the time down a little. Love the look of your duck and the salad. You may have inspired me to have another go (this time remembering to line the wok!). I had no idea of that technique, sounds interesting! Love the plate, BTW. I can always send you a hanging duck from one of the shops here in HK, if you get your craving. Just kidding! However your recipe sounds very delightfully healthy and love the picked vegetables. Gorgeous pictures Martyna! I love duck. It’s so wonderfully rich and meaty for poultry, and having the fragrance of the tea and the sourness of the pickles to cut through sounds like it would be absolutely delicious. I’ve been thinking of smoking duck a lot lately! What a tasty meal! This looks lovely. i can’t say i have smoked meat of any kind before but this does make me want to try. Your shots are gorgeous as well. I am happy that I discovered this post about smoked duck breast. Does the sauted duck go directly on top of the smoking tea leaves or have they all buried away by the time the duck is put in the wok. Wow, this looks gorgeous! My husband and I love tea smoked duck, but I didn’t know how to make it. I will have to make it one day. Your presentation is beautiful!